***I received a sample product in hopes I would share my thoughts here on Momma Told Me. All photos and opinions contained below are copyright Momma Told Me Blog 2015. Momma Told Me: Beauty is only skin deep. 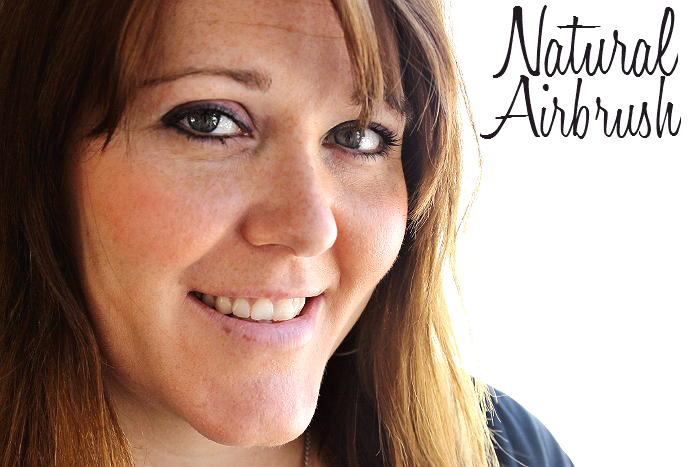 Airbrushing, as a term, has quite the negative connotation among modern women. 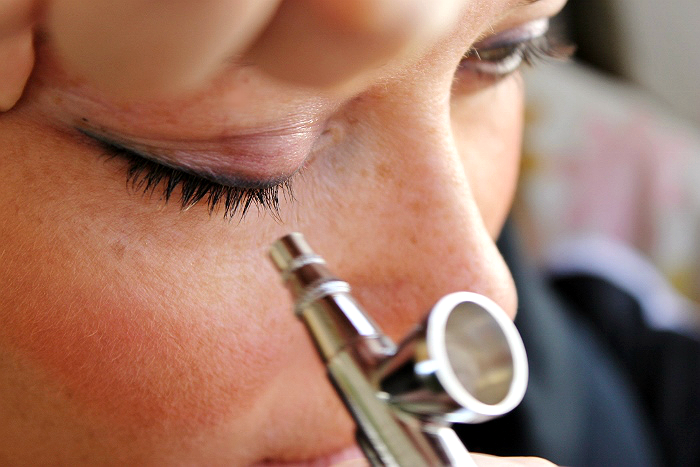 Whether you're discussing the latest cover of Cosmopolitan or the actress walking down the red carpet at the Academy Awards, digital and physical airbrush treatments, to enhance beauty or conceal flaws are often associated with professionals and celebrities. I've often struggled with the difference between removing a zit on a model's face in Photoshop versus covering it up with layers of makeup. To me, it really makes no difference. And, at the end of the day, such a thing is trivial compared to the aspect that blemishes, puffiness, and skin tone are ever changing. My personal stance is, if you wear makeup to enhance beauty, it doesn't matter how you do it. That being said, many women do not realize that Airbrush Makeup Systems actually can enhance natural beauty far easier than traditional, or even mineral cosmetics on two levels. Not only do several airbrush makeup companies make hypoallergenic and 'natural' formulas for use with their systems but their are also several mom and pop style brands that custom make organic and natural sourced cosmetics for use with them. Most importantly, the finite nature of airbrushing makeup allows for a controlled application that is as light and natural in appearance as the user desires. In fact, thanks to the fine distribution, only a few drops of foundation go into the average full facial application. Because the makeup is distributed at such a fine ratio, over such a wide canvas, at once, the minimization of imperfections in skin tone is magnified and dramatically instant. Using an in home airbrush system can save you money, space, and even offer versatility with a wide range of products. If you're like me, you're probably intrigued by the concept of a personal airbrush system, but concerned about the cost of investing in a system itself, and the ease of learning to master it. 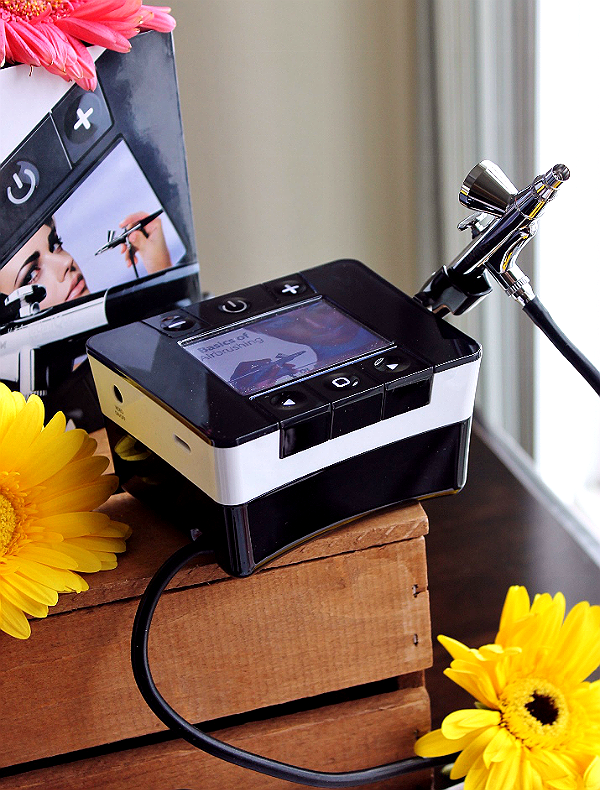 Luminess Cosmetics manufactures several ranges of personal airbrush makeup systems starting at just under $200- I even spotted (pun intended) a limited edition Leopard Basic System in the online store! 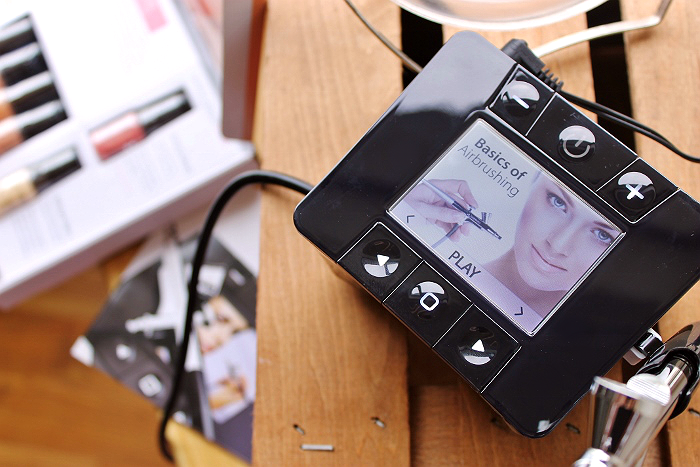 There are hours of free to access 'how to' content through the brand and on YouTube- but the Luminess EPIC Airbrush System really spoke to me (literally.) This brand new PRO system has a built in screen with video walk throughs for basic techniques and more! Let me introduce you to Savannah, Sabrina's mother. You've all met her before, but we're going to get a little up close and personal with her pores so I figured a formal introduction was appropriate. These photos were taken just over a week after the birth of her second child. 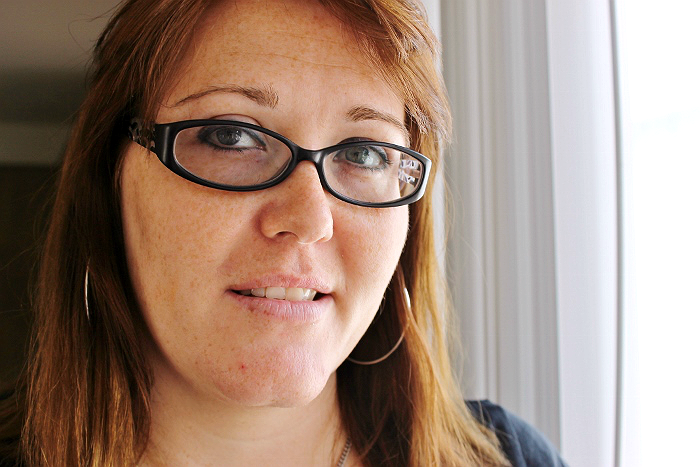 Having just endured her first pregnancy in 11 years Savannah felt like a stranger in her own body and was struggling to reclaim her personal identity through the difficult postpartum period. Can you believe this woman didn't feel beautiful? So I staged an intervention and brought the Luminess EPIC over for a girl's afternoon to see if the two of us could master, or at least manage, personal cosmetics airbrushing. The unit itself is surprising quiet, with a powerful but humming air compressor that remains on during use through a simple switch mechanism. 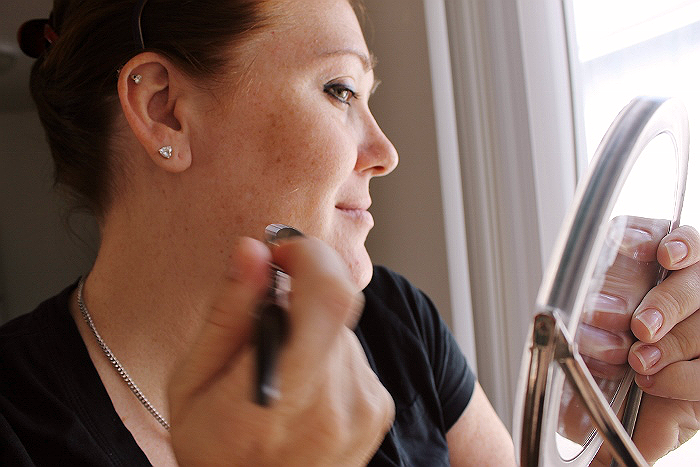 Most Luminess systems come with a starter kit, including primer and moisturizer for application prior to makeup. Using the stylus is as simple as placing 3-4 drops of your desired cosmetic into the stylus barrel and pulling back on the flat (top located) trigger while applying in sweeping motions 5-6 inches from your face. If you are applying at the right distance you should not feel 'wet' or 'sticky' during the process. The key to even application and a natural finish is to remain moving constantly and to maintain an even distance. 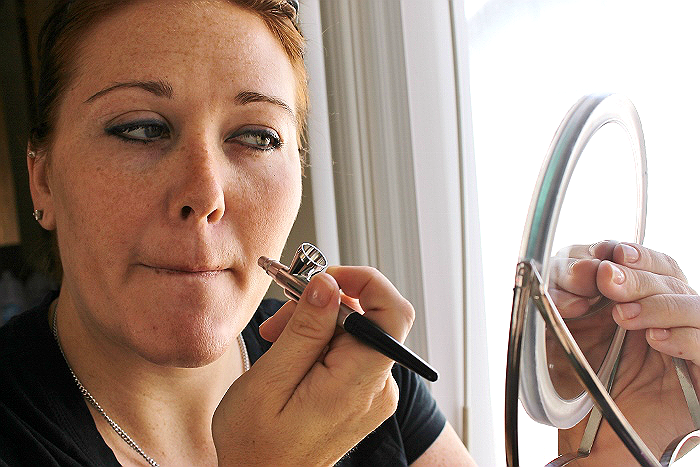 Basic application of foundation will take a few uses to truly master- but you likely did not learn to put traditional makeup on overnight either! The videos are extremely helpful with full 'pause' modes so you can visually see the techniques, as well as listen to the audio cues before application. Once you've figured out full face (foundation) application the rest is pretty much child's play as blush allows for a more dramatic (closer application) and eyeshadow is perhaps the strangest part of the experience. Luckily the flow of air emitting from the stylus can be controlled in intensity and is fairly tame on a closed lid. 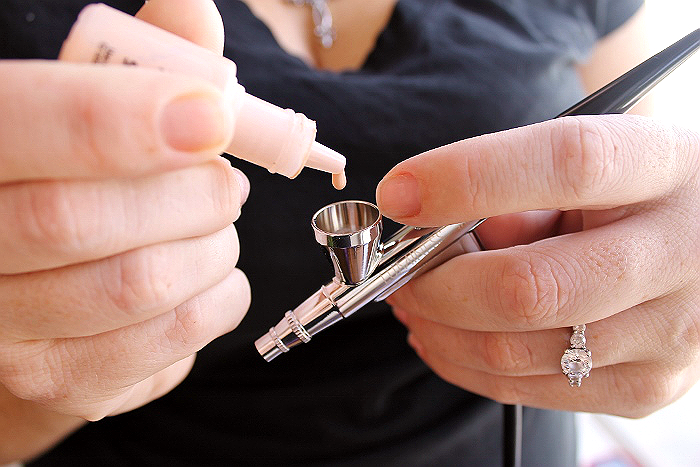 Using an airbrush cosmetics system also allows for customization of skin tones and shade blending. Your starter kit will come with 4 shades of skin tones in Light, Medium, or Dark kits. You can literally create and match any hue of skin by alternating various drops of different shades directly in the barrel before application. Your first use will require some playing and swatches o the back of the hand, but once you're figured out your skin tone, you're all set. Best of all, you don't need to buy new makeup during the Summer when you tan, or such, as you can always blend a new hue to suit your skin's changing complexion. 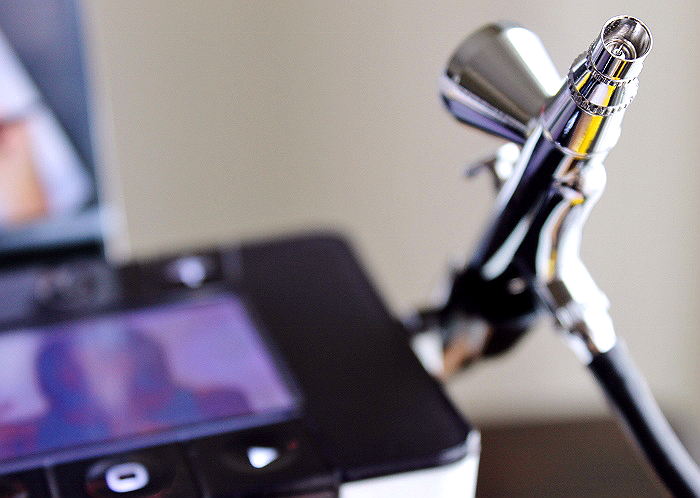 Cleaning the airbrush system is very basic and primarily involves running a few drops of water through the stylus before changing colors or putting the unit away. There is a slightly more involved cleaning technique that should be done about once a month to deep clean your instrument and keep it running at optimal performance. We found no irritation or sensitivity in using the Luminess brand of cosmetics and even noted that we felt as though we weren't wearing makeup at all, throughout the day! 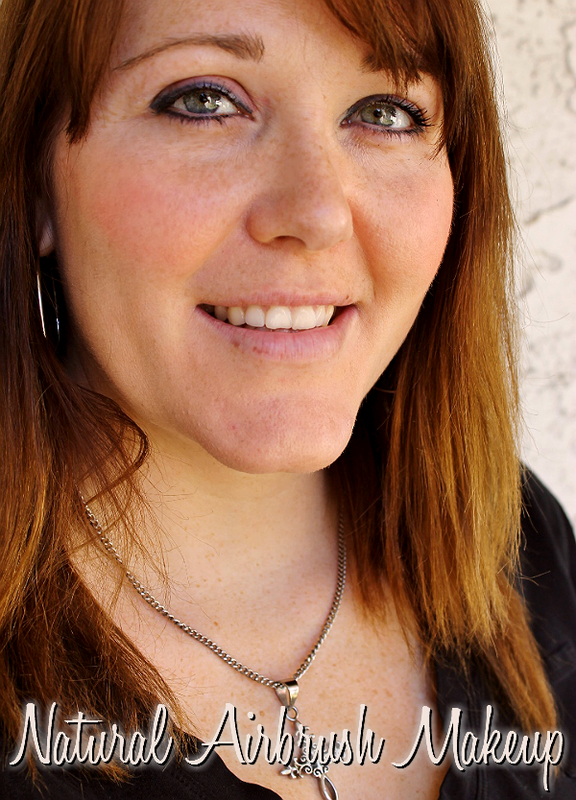 Savannah has beautiful skin and gorgeous freckles- I was glad to see the character of her skin could still shine through the Luminess airbrush makeup, while still providing the control and even finish she was hoping for in her look. This natural look takes about 5 minutes to apply and just 9 drops of product, which means the starter kit alone could last an individual a month. Refill cosmetics are available in house around $8-$12 a bottle, and online through independent brands for $6-$8. Of course, after waiting for the adults to figure out and play with the Luminess EPIC for 2 hours, ever so patiently, Sabrina wanted her turn. 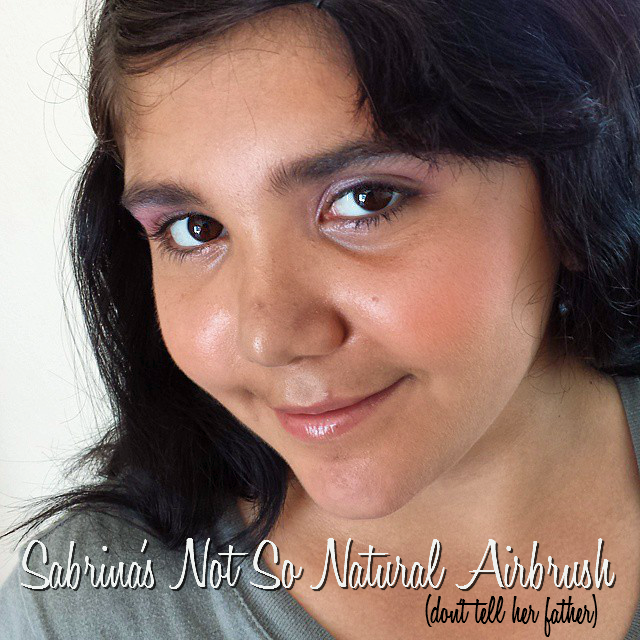 I should note we do NOT let Sabrina wear makeup for any event, so this was a very special and one time treat for her (and boy did she ever get a big head, that girl is going to be T-R-O-U-B-L-E.) Using the same cosmetics her mother and I used, I applied slightly thicker application to emulate that which the typical user might apply for a more formal day. It's important to note that we matched Sabrina's skin tone with the SAME colors we used to match her mother- impressive, right? 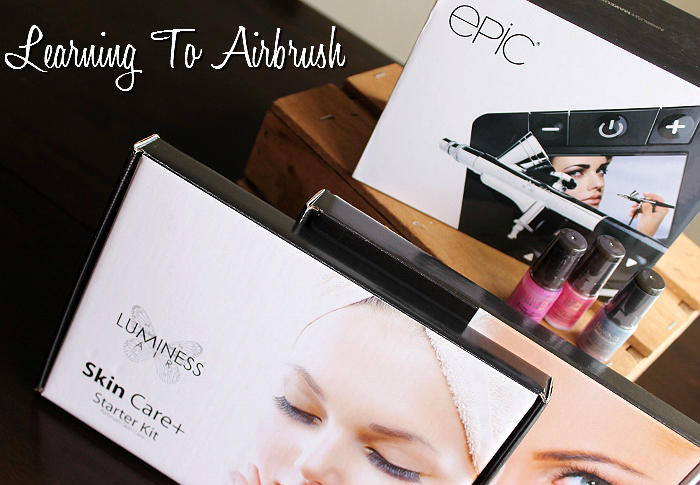 Overall, the Luminess EPIC system is great for beauty enthusiasts who want their first airbrush system, though I feel moderate cosmetics users will be able to enjoy the basic Luminess systems at half the price with the use of YouTube tutorials. In all, I've decided that airbrush makeup can be very practical in appearance and cost, and encourage anyone curious to try it out. Check out the Instagram video below for a little more info on how the EPIC works. What Daughter Says: Let more of your skin, and natural beauty, show through airbrush makeup application. The new #LuminessAirEpic system is hear. Learning how to apply #eyeshadow with an #airbrush system has never been easier with built in video tutorials! #beauty #ontheblog soon! 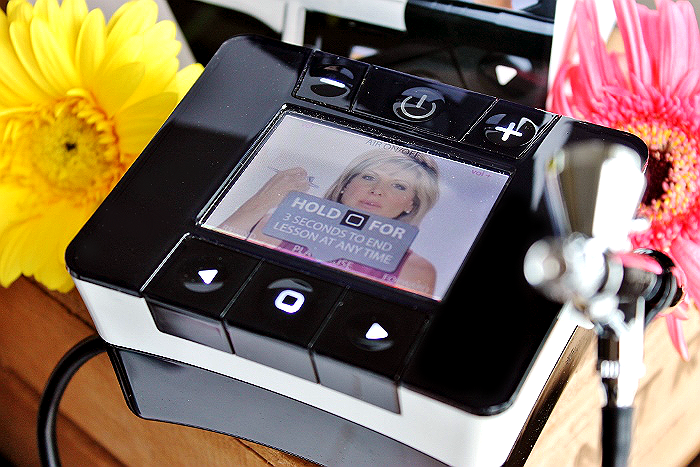 Wow, this makeup device is so impressive! I love the natural beauty look this airbrush provides. My Dad has always said pretty much the same. Less is better, women are naturally beautiful. I believe that less is better with makeup as well. I love how natural this looks on her skin!! I love that natural look! I would not have thought that air brush makeup was so quick to apply either! 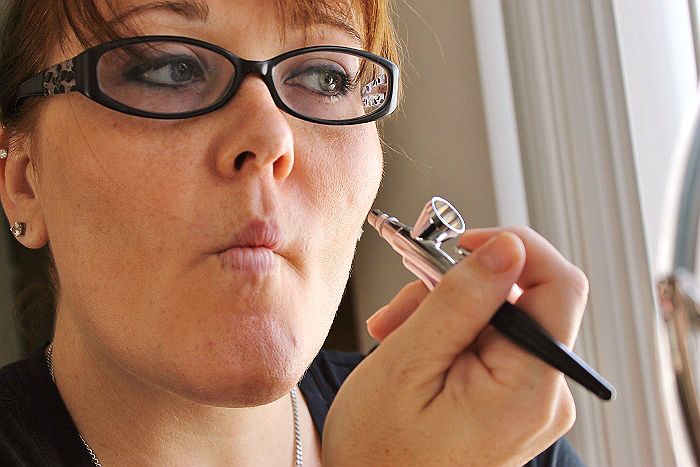 Ok...I've used airbrushes before, but didn't realize you gals could use them for makeup. Going to need to lock mine away in the garage! Love the final look with the airbrush system! Sounds like you could do a nice makeup look with just a little bit of practice. What a great system! Just like how the stars do it. 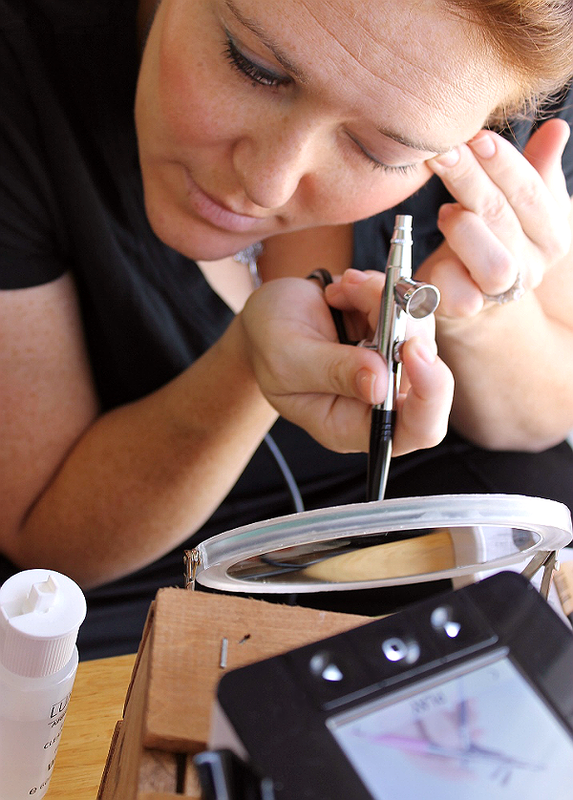 I use an airbrush for a lot of things in my house but never thought about it for my own make-up. So cool! I bet this would make my makeup routine easier. I love the way the finished applications looks. You did a wonderful job. I'm sure it was fun to use too! If I were working I'd be all over it but I haven't worn makeup in almost 20 years now. I have an older model of the Luminess and love it for special occasions. I am a little jealous of the Epic though, it seems pretty amazing and the results look very professional. I think, I'm quite lucky to get such a post which is really informative and my type. You seems to have a lot of knowledge on such electrical maters. Can you suggest me one from best air compressor reviews?